The above chart illustrates Prospective Healthcare Acquisition or Refinance Transaction. 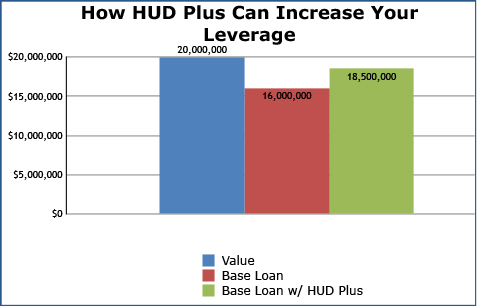 HUD Plus permits additional financing up to 92.5% of value; however, actual amount of HUD Plus loan subject to Underwriting. HUD Plus is a program offered exclusively through our parent company, HJ Sims. This program enables our clients to increase their leverage on a healthcare transaction beyond the standard 80% loan-to-value threshold up to 92.5% of value through the issuance of secondary financing structured in accordance with HUD’s requirements. HUD Plus is a flexible program. Our clients have used it to acquire or recapitalize healthcare properties with bridge financing that eventually will be refinanced with HUD-insured loans. Under this two-step structure, the HUD Plus debt is closed at the same time as the bridge loan, but is designed to meet HUD’s requirements in advance of the HUD-insured financing. This enables our clients to acquire properties on short notice while retaining the advantages of higher leverage and a HUD-insured take-out at a later date. Alternatively, HUD Plus can be used in connection with refinancing existing debt or acquiring a property directly with a HUD-insured loan. Our clients have used this option to finance the acquisition of skilled nursing facilities from REITs where the lease agreement provided an option to purchase, or to recapitalize properties with high-interest rate debt. Moreover, owing to the large network of investors who have successfully invested with HJ Sims over the years, HUD Plus subordinate financing can be structured on a flexible basis with respect to amortization, terms, recourse provisions and covenants. Combining a HUD-insured loan originated by Sims Mortgage Funding with HUD Plus provided by HJ Sims results in a capital stack with the best of both worlds: long-term, fixed rate financing and additional funding to get the deal done. Since 1965, HJ Sims has provided financial advisory services for senior living communities across the country. We deliver the right expertise, the right strategies, and the right solutions to meet your needs.